I was lazing around on the Internet and i came across the above quote from my favourite author Paulo Coelho, i thought to share. I am a firm believer in the notion that I control my own destiny and this quote affirmed that for me. At times when we feel down and out it is so easy to feel like we are no longer in control. Then we surrender to “fate”and that means we are basically saying whatever happens happens. I feel this is taking the easy way out…this is surrendering responsibility of our lives to an unknown force,then we sit back and do nothing. That way we don’t have the blame if something goes wrong….mmmh wouldn’t that be nice. 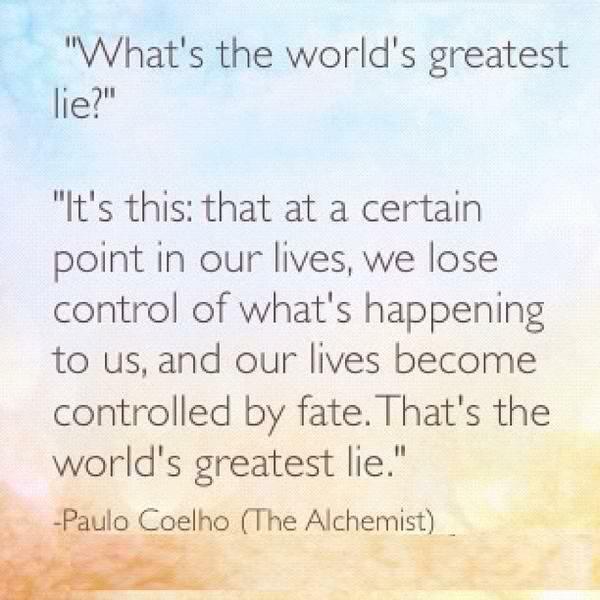 To just blame fate for everything…. Well I am learning everyday that I am responsible for my thoughts which in turn inform my actions. Yes in some way our lives are predestined, but our everyday actions make us who we are and we actually might not get to our destiny if we keep making wrong decisions. So its my choice to decide what is happening to me, my choice to decide whether I like that situation or not and then my choice to leave or stay in that situation. It is my choice to decide to do the right thing, to choose the left turn and not the right. Look at it this way, you might get lost but then you went on an adventure trying to find your way. A chance to learn. I remain in control….I like knowing that I chose this path and I can answer for it. Surrendering to ‘”fate”means not being able to explain how it happened. I guess I am a control freak in that aspect. So thanks to Paulo for the above quote and for reminding me that I shape my own destiny. This means my circumstances do not define me, do not cripple me because I can take steps to change them. If you are not happy with a situation do something to change it and if you cannot change it pray for the serenity to accept it. Life is an everyday challenge but for someone who loves challenges I say bring it on….